We find it fairly easy to sit down as a family and watch a TV show together, don't we? If we want to help our children become better readers and writers, why not schedule a set daily time for reading, and one for writing too. Let's call them read o'clock and write o'clock! Write o'clock could be a time after dinner when everyone writes in a journal or diary, reflecting on their day. Some kids will enjoy choosing a special book for this, or older kids might do their reflecting via a computer. It could also be as simple as writing a list of things to remember for the following day. Lists are writing too! Special times demand other writing activities: birthday cards, letters to friends, poems to celebrate Valentine's Day, story boards for a movie project, creating directions for a board game - whatever needs arise. Lots of families have read o'clock at bedtime. It's a nice way for kids to unwind before sleep, and a lovely opportunity to snuggle together and share great literature. Most kids enjoy choosing books for this time. Sometimes they choose the same book night after night, but that's an important part of learning to read too, as it helps them memorize text. Kids are never too old to join in a family read aloud, which is a perfect activity for read o'clock. Continue read o'clock with some silent reading too, if you want. Once kids can read independently, they will enjoy extra quiet time where each family member is immersed in his or her own book. Sometimes, they'll want to read after lights out. I shared my secret implement to help with this on Soup Blog recently. 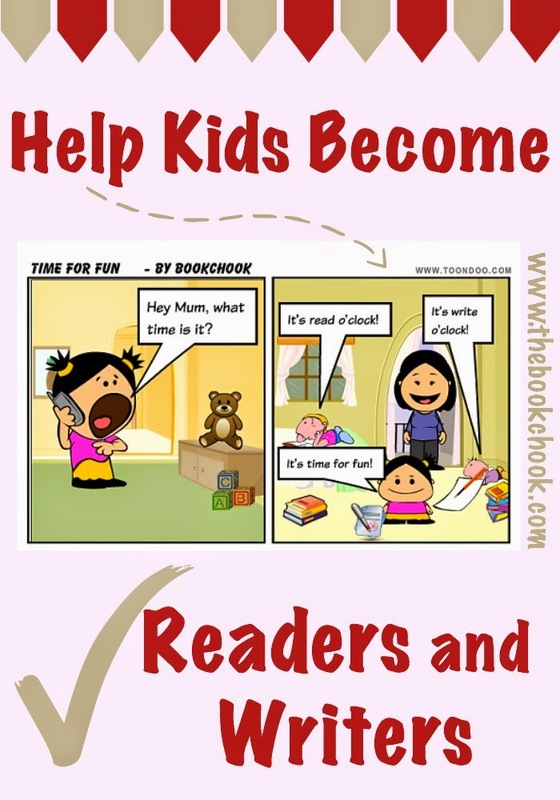 It's important for our children to see us reading, AND writing. It shows them we value both activities, and that makes it more likely they will too. Once read o'clock and write o'clock become an integral part of family life, they become a habit that we look forward to, and maintain. I LOVE this, Susan! Brilliant!! Very cute, Susan! It's so important to take time out every day to read and write; and since many families have more down time during the summer, what a great time to start building it into the daily schedule. Younger children who are learning to tell time will especially love the o'clock theme. Parents could even build some math activities about time into the process by asking, for example, how many minutes until read o'clock? Or, how many books, and which ones, will we read tonight? They could even keep a reading log to keep track of the books they read, and write about which ones they like the most. How about putting that in a letter to Grandma? Oh, see how you've got me thinking....I better stop now. Oh such a good idea to do Write o'clock. I'm adding new notebooks to the shopping list now. Dawn , those are great ideas for adding value to read o'clock and write o'clock! Thanks for contributing to my post! I know I always loved new notebooks as a child, Rebecca. Still love to choose them, or pore over stationery catalogues! Recording dreams is such a neat idea, and great fodder for those developing imaginations, too. But write o'clock is another great idea. Brilliant!! Hi Cynthia, So glad you celebrate reading too! Oh, I like this ... I must confess that I have not been as diligent in my journal writing as I had planned back in January. The goal was for C to see me writing more. But, today is a new day, right? Absolutely, Terry! Once we're mindful, lots of little writing opportunities arise anyway, but making a set time each day is more likely to develop into a habit, in my opinion. Love this article! I love the idea of Read a clock and Write a clock. Thanks for these great ideas.